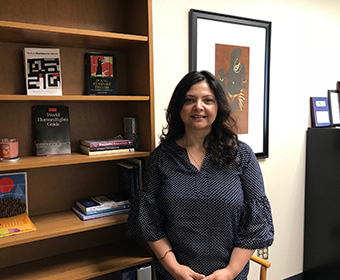 Bonita Sharma is an assistant professor in the Department of Social Work at the UTSA College of Public Policy. She earned her bachelor’s degree in Biology and Chemistry, a master’s in Social Work and a Ph.D. in Social Work from the University of Texas at Arlington. Her research areas focus on gender, sustainability, natural and built environments, community and global health, technology as intervention, empowerment and leadership of women, human migration and global social work. Her work has been published in The British Journal of Social Work and the Journal of Women’s Health. Sharma has participated in Global Health Projects on HIV/AIDS and gender-based violence, and was recently appointed to serve on the Council on Global Social Issues, a council of the Commission on Global Social Work Education (CSWE). The CSWE works with other international organizations to promote international programs and projects and to develop the international dimension of social work curricula. We sat down with Professor Sharma this week to learn more about her research. Can you tell us about some of your current work? My research focuses on gender and environment using sustainable development framework. My most recent project examines the impact of extreme weather on physical and mental health factors and the different ways various social, natural, human and economic capitals moderate the impact, using a gender perspective. I believe that promoting capital approach to strengthening the lives of people for a resilient future can mitigate the health effects of climate change. This project is in collaboration with Professor Lisa Reyes Mason from the University of Tennessee-Knoxville. The purpose of the project is to assess gender and environment in the City of Knoxville, Tenn. Based on the findings of the study, I hope to test this framework in Texas, where weather extremes disproportionately impact poor and vulnerable communities. My research interests and specialization on sustainability science are built on my experiences of having worked on a broad array of research projects in local and global contexts. I focus my work around women and development within the environmental nexus since, consistently, women have been ignored in many policy decision-making processes which have set them behind in all other aspects of lives. Climate change and environment is a pressing issue of our time, and studies have shown that women bear most of the brunt of its impact. Including women in protecting the future of the earth system and accessing women’s knowledge, their capabilities and their impact of collective action can have a potential impact in enhancing the socio-economic and environmental development, globally (Women’s Survey, 2014). What drew you to UTSA? UTSA is a thriving university leading in innovative research, partnerships and education to promote sustainable environments in the region. Along with this leadership of responsible future for the city and the campus, the Department of Social Work in the College of Public Policy also promotes a transformative culture in research and education with emphasis on cultural competency and holistic social work. The faculty, staff and students here are a pleasure to work with. The collaborative opportunities in research, various funding support availabilities, mentorship and research are promising. All of these factors are a winning combination for my research in sustainability, gender empowerment and global social work. Tell us about your recent appointment to the Council of Global Social Issues. I am honored to have been selected to serve on the Commission on Global Social Work Education. This appointment will give me a platform for advocacy on contemporary global social issues and facilitate international research. Moreover, the appointment recognizes my expertise in my field at a national and international level. Tell us about the most important thing going on in your field that people aren’t talking about. Global change can increase societies’ propensity to conflict by changes in socio-structural conditions (e.g. resource scarcity, migration). The conversation today is about politics of climate change which is often discussed in abstract terms, a far distant future occurrence. However, what has not been talked about, as it should, is the effect of climate change on people’s health and wellbeing. Human-caused greenhouse gas emissions pose threats to public health, with experts warning the scientific community that even a small global temperature increase could lead to troubling consequences. Rising sea levels, population displacements, disruption to the food supply, flooding, and increase in infectious diseases, are some of the consequences that are imminent but have not garnered a lot of attention. What advice do you share with students who are interested in entering your field? I would like to tell students to think beyond the obvious on social justice issues. Thinking holistically to address people’s issues using the systems perspective can empower them. For example, climate change may seem like a field different than social work, however, just like in many ways, economic and social issues impact health, relationships, opportunities and resources, so does environmental factors. Also, be open to learn what others around the world are doing to address this concern. Go beyond your local community to explore and understand the client system and ways they are interconnected.